Purpose This FAQ (frequently asked questions) is meant to convey information about U9 (Under 9 years old) competitive/traveling soccer. It should give prospective soccer parents enough information to make an informed decision about involving their child on a competitive soccer team. History In the past (prior to the Fargo Soccer Club's inception in 2007), competitive soccer in Fargo started at the U10 level. For the age group definitions, please click here. Players at the U8 or U9 level would have to compete with players at the U10 level for a spot on the U10 team. Traveling soccer can be started at any age. For example, Minnesota Youth Soccer sanctions competitive leagues and teams start at the U9 level. The Fargo Soccer Club founded U9 soccer in North Dakota in 2007 and the rest of North Dakota has now 'seen the light' and started to play U9 soccer. See the www.ccunitedsoccer.com website for an example of a Minnesota youth soccer club which offers two levels of competitive soccer at the U9 level. For the Fargo Soccer Club U9 teams, we have U7, U8 and U9 players participating. We may have a extremely gifted U6 player participate. Rec Soccer Recreational soccer in the Fargo Soccer Club typically involves 2 soccer events per week; a practice and a game. The Fall season is 6 weeks long while the Spring season is 10 weeks long. Everyone plays equally at every position and for the same amount of time. Coaching is typically done by parent volunteers who may or may not have any soccer experience or soccer coaching training. The cost is minimal. Competitive Soccer Competitive, aka traveling soccer may involve a try-out and team placement. At the U9 level, we typically will not have try-outs. A high proficiency and motivation are required to participate successfully at the competitive soccer level. Players who are obviously suited better for recreational soccer will be directed towards recreational soccer. Only the top 10-40% of recreational soccer players will be comfortable transitioning to the competitive soccer level. U9 Soccer in the Fargo Soccer Club is transitional. Our U9 teams play in our rec league against older rec teams. They will also play in any competitive scrimmages and games we can arrange locally. Our U9 teams also play in tournaments; usually in Fargo, Grand Forks and the Twin Cities. However, they don't play as many competitive games as our U10-U19 teams. We do this because U9 soccer is not 'full blown' competitive soccer. It is a hybrid, i.e. a transition from recreational soccer to competitive soccer. It is this way because there is a lack of U9 competition in the area. Starting in 2011 we provided options for U9 soccer based on the age of the team and the parents' willingness to travel and have their child play more games. Some U9 teams, especially younger ones, i.e. U7 and U8 teams, will only play in 1 Twin Cities tournament and and local Fargo tournament (which now has a U9 bracket). For those teams, that is an adequate introduction to competitive soccer. For other U9 teams, especially ones with all U9 players, the team may opt to play in a local U9 or U10 league and participate in 2-3 tournaments during the summer. Those teams may also opt NOT to play recreational soccer. In that case, they will practice more often. Competitive U9 soccer in the Fargo Soccer Club involves an additional practice each week. For the Fall, we typically schedule one October tournament in Blaine, MN - the NSC Fall Cup or the Woodbury Fall Classic. For the Summer, we schedule from 1-4 tournaments; depending on the age and experience of the U9 team. Any local tournaments would be at the U9 or U10 level. We typically play in the early June TonkaSplash tournament. We also schedule scrimmages with clubs in a 100 mile radius of Fargo. Pre-season Summer training and practices typically only involve 2 practices per week at an indoor facility or, weather permitting, outdoor field. Players are expected to commit to soccer as their primary sport and forgo other sports when conflicts arise, e.g. baseball, basketball, hockey. Since soccer practices are somewhat flexible, soccer teams can schedule practices around fixed baseball, basketball or hockey schedules; something those sports typically do not do. Soccer games can start in early May but are typically start in mid-May with weeknight games against teams like Detroit Lakes, Fergus Falls, Alexandria and Grand Forks. Kids playing on our U9 traveling teams typically also play in a local soccer league; playing up 1 or 2 age groups. Pre-season and Season Pre-season indoor turf training can start anytime but we anticipate twice a week training from mid-March to mid-April. Outdoor U9 practices will be twice per week. Scrimmages At the U9 level, we can schedule scrimmages with other local teams (Bemidji, Detroit Lakes, Fergus Falls, Alexandria) at little to no added cost. Kids like to play games rather than practice. We will play as many games as makes sense while keeping a good balance between practice and games. Pre-Season Meeting Usually in January or February for the Spring/Summer season, the team holds a pre-season meeting to discuss expectations, schedules and go over the ground rules for the upcoming season. Our team meetings will occur in August. 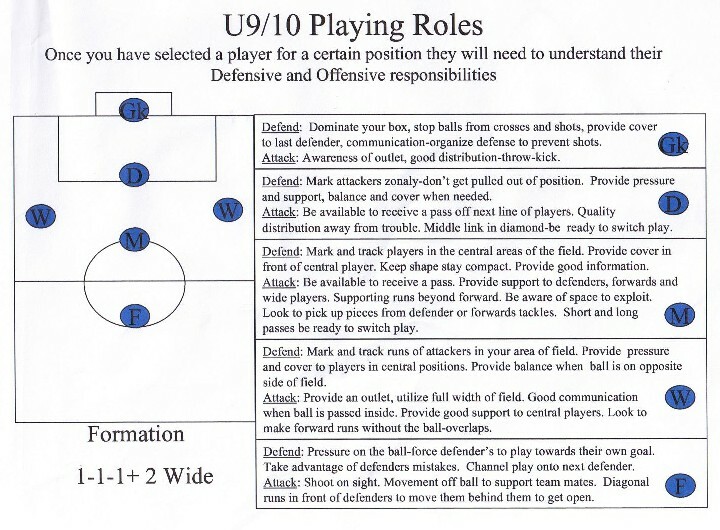 Expectations At the U9 level, each player is expected to play every position in the 6v6 playing format. Every player will play an equal amount of time each game. Small variations may occur due to player absences, position assignments or other variables. Winning is secondary to other goals such as player development, team morale, sportsmanship and enjoyment. Players will be evaluated at least twice during the season based upon (1) attendance at all team events (practices, games, meetings), (2) coach evaluations. Costs U9 soccer is not as intensive as U10 or older soccer. We generally charge $140 for the Fall season and $195-$325 for the Spring/Summer season. The uniform is typically an additional $45 and can be reused for future seasons. Coaching Trained coaches will conduct pre-season training, practices and season coaching. US Soccer certifies coaches at the A, B, C, D, E and Youth level. Youth-trained coaches receive the least amount of training; usually 3-6 hours. E-certified coaches receive 18 hours of on field and classroom training. D-certified coaches receive 36 hours of on field and classroom training. A small number of D-certified coaches are allowed to obtain C or higher coaching licenses run at national coaching camps. A coach with a C license typically has a full week of training at a national coaching camp. Most competitive traveling coaches have personal soccer experience but some do not.